Q: What makes the water-fed rod more efficient than other established cleaningtechniques? A: Unlike the original ladder & squeegee method, the water-fed pole allows the cleaning team to reach casements from the safety of the ground. The expandable pole is 22 metres high and can easily reach even blemishes on the fourth floor of your building. Q: What other washing alternatives are are contained within window cleaning Northwood? A: Besides providing meticulous exterior window cleaning, the certified technicians can also climb and wash any commercial skyscraper – a service known as rope access window cleaning. Finally, the cleaning experts can also deal with stains found on the interior surface of your panes, and will employ ladders and squeegees to access hard to reach corners. A: Our water has been purified from all naturally found hard minerals. As a result, it will efficiently dissolve all streaks on its path and will vaporise under the sun without leaving residue marks of its own. A: Yes, the Northwood window cleaners will come with the latest cleaning gadgets to wash commercial buildings both small and elevated. The pros can also perform additional washing tasks, for instance patio washing and gutter cleaning. A: Absolutely. The team's water-fed pole is linked to a special purified water storage inside the cleaning caravan. In case the fluid has been used up, the cleaners will kindly ask you to offer them with any inside or exterior water source. A: Yes, all our services are comprehensively insured for your peace of mind. However, our washing technique is among the safest that you can find on the market and we'll make sure to polish your panes without leaving a single scratch! After reading through lots of client feedback, we've altered our window cleaning Northwood's charges. Now, you can schedule our service at prices that are nothing short of competitive! For further information, please take a look at our price table below. With window cleaning in Northwood, we can increase the appeal of your property even if it touches the clouds above. Let's look at what you'll get once you schedule our custom-tailored service. For outer window rinsing, the Northwood window cleaners will deploy a expandable water-fed rod. A water pump inside the specialists' van will pump filtered water up the hose and out of a brush-head extension. The water, together with the brush-head, will undo any traces of dust from the panes of any four-storey premises. With rope access window cleaning, the experts will use reliable abseiling tools to reach even the topmost storeys in your industrial or residential property. We own all necessary COSHH documentation and risk appraisal reports and can send them to you in no time. Also, we constantly check the cleaning gear to ensure that your booking will go without any complications. And to dight every inner corner of your glass surfaces, the experienced team will use the classic sponge and ladder cleaning procedure. 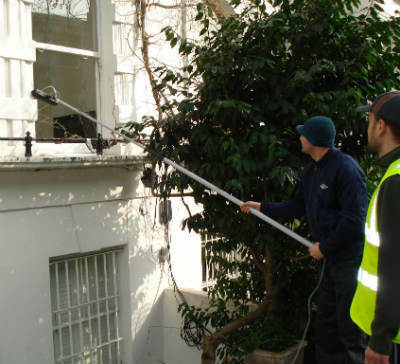 As we obtained more and more positive reviews from our clients, the request for window cleaning in Northwood has noticeably skyrocketed in adjacent areas. You can check the regions we've covered in the list below. Another quick and easy way to get a free instant quote or to book window cleaning services Northwood HA6 is through our web site.